If you’ve ever been accosted by a young man or woman who’s desperately trying to sell you over-priced magazine subscriptions—maybe at your front door, maybe in a shopping mall—you’ll immediately recognize the hustle at the core of American Honey. Writer-director Andrea Arnold depicts the world in which these scamming youngsters live with documentary-like precision. Over the course of two hours and 45 minutes (indulgently long, but never boring) we meet the various members of a “magazine crew,” nearly all of them portrayed by first-time actors. The breakout star is Sasha Lane, who anchors every scene as teenager Star. When we’re first introduced to Star she’s rummaging through dumpsters, salvaging raw chicken and other discarded food. She has two young children in tow, but her relationship with them is unclear. At home, she’s groped by an older man—possibly a stepfather, or just a boyfriend of her mother’s. Arnold keeps us disoriented as we try to figure out the exact nature of Star’s living situation (we never fully do, in fact). The kids turn out to be her mom’s, who is too busy practicing her line dancing at the local Country & Western bar to give a darn about his kids’ welfare. But Arnold’s not judging here, just depicting. As she did in the outstanding 2009 drama Fish Tank, director Arnold captures the milieu of these hopeless, go-nowhere characters with exactly detail. 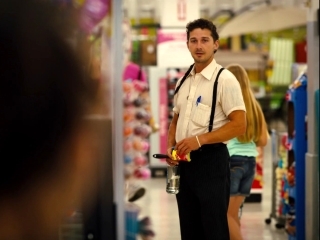 Hope actually does arrive for Star, after a fashion, in Jake (Shia LaBeuof). In a low-rent ‘meet cute’ at a grocery store, Star is captivated by Jake’s affably carefree attitude as he dances around on a counter top. He invites her to to Kansas City, the next stop for the magazine crew he travels with (they all assume the city is in Kansas, cracking wise about Dorothy and Toto). These young adults are like modern-day nomads. Life is a series of cheap motels, weed- and booze-fueled partying, fights, hook-ups, and (of course) the peddling of magazine subscriptions to sustain their low ambitions. Crew manager Krystal (Riley Keough) drops them off in any given anonymous neighborhood and the kids make up any sob story they can in order to hook customers. There’s little conventional “plot” in Honey. Arnold isn’t interested in exposing the illegitimacy of the “business” practices of the crew managers. This is a glimpse into a niche lifestyle. We don’t really find out what happens to these young adults when their usefulness as “salespeople” wears out. They travel with the constant threat of abandonment, each of them apparently clinging to the crew as a surrogate family. But Krystal isn’t their mom. She’s their boss and never lets them forget it. Star’s story is the focus. She’s hesitant to tell outright lies to potential customers, flirting with other ways to spark interest. Lane plays Star’s arc—her gradual awakening to the need for a major course correction in her life—with delicate subtlety. American Honey offers no easy answers (and a few moments jarringly break from the verite-style realism, including Jake’s method of reuniting with companions after becoming lost), but it never ceases to hold a grip.